Club Monaco November 2012 lookbook looks great offering dark shades as opposed to their October offerings that included lots of whites. The clothes is stylish and interesting allowing mixing and matching and creating new outfits. 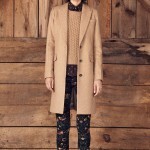 There are sweaters, fancy skirts, tailored coats, and some leather pieces in the lookbook. Fur vests also come in several colors and designs together with a leather-sleeved jacket and a fur coat. A couple of blazers can be worn over cream and light brown shirts and blouses, black, patterned or burgundy sweaters. There are also a couple of tailored classic trousers which can complete the office look and some skinny pants including the ones in trendy burgundy color. The outfits in the lookbook are completed with brimmed hats, knitted hats and berets as well as printed and knitted scarves and small crossbody bags. The prints are mostly floral but there is also a polka dot blouse and a suit in a geometric print. 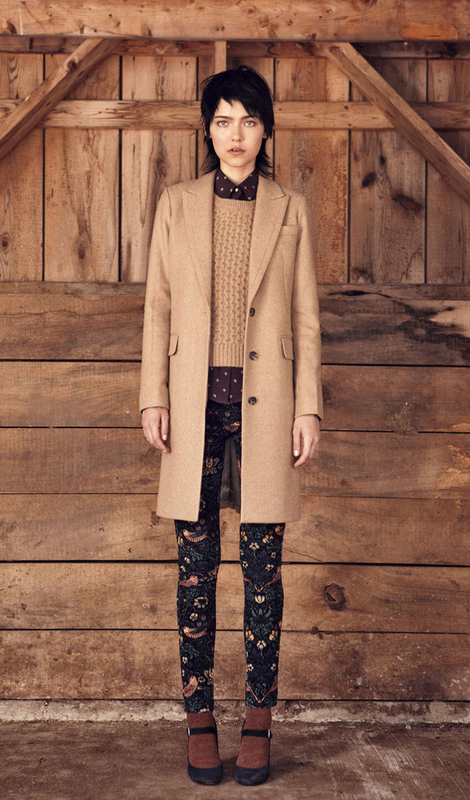 Dark colors in the lookbook’s clothes are mixed with warm shades of brown. Some pieces are decorated with some sparkling threads so you can easily create a glamed up dressy outfit.